We offer low-priced plans to help smaller organizations end those daily frustrations and start to grow, all the way up to custom plans built to suit your needs. See below for details of what's included in each plan (the Custom Plans are just a sampling--we'll mix and match to suit your needs). Designed to help small organizations equip themselves to grow. Ever watched an animal coil itself up to spring? Before that leap happens, every muscle has to be in the right position. Our Nonprofit Starter Plan is designed to help you do that. We’ll help you dramatically improve your knowledge of your own follower base, develop the tools and strategies you need before you can grow significantly, and make sure you know what technology to invest in (and avoid). When you spring, you’ll have judged the distance correctly and have the power behind you to complete the jump. Then we’ll keep helping you identify new prospects and improving your ability to reach them. The new you? A team that knows exactly where it’s going, how to get there, and is making it happen with minimal distractions. Thank you! We will be in touch as soon as this plan is launched! Designed to help midsized organizations expand their networks. Our most-requested plan! 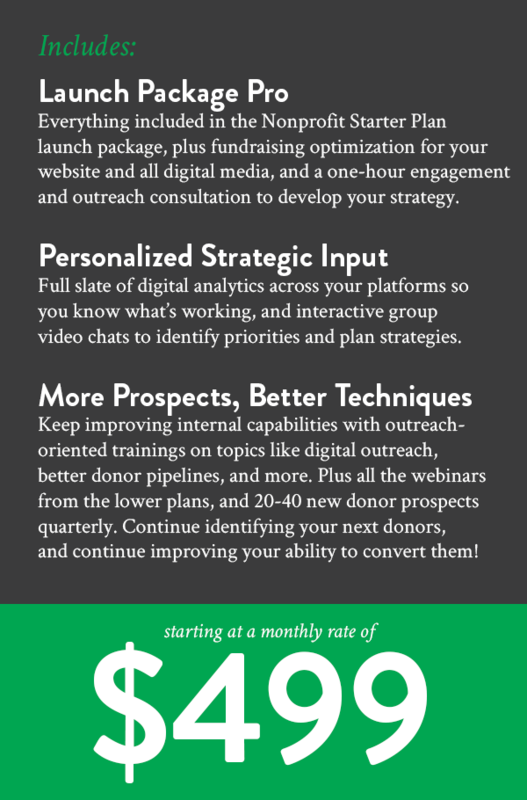 For organizations that want to invest more aggressively in their own future, this plan provides all the same groundwork as the Nonprofit Starter Plan (as needed), but adds in a variety of outreach-focused components. We’ll work with you to devise an outreach and engagement plan based on your target donor profiles, identify even more prospects, get better at using modern tools and techniques to greatest effect, and run the campaigns that turn strangers into new friends. Your daily operations tell a story. It’s time the right people became a part of it. Thank you! We're working hard to build this plan--we'll take your feedback into account, and get you more information soon. Designed to allow you to do everything you ever wished you could. “Oh, if only we had…” The sentence might end with a strong brand that was known all over the country, a modern prospecting system that went to work for us, a world-class profile and pipeline system for every target donor and every generation that practically ran by itself, a state-of-the-art website, or the people to tell our story compellingly across every medium. But the real reason it’s spoken is always that there’s some specific thing holding an organization back. Our custom plans are designed to make that a thing of the past. Our team will work with you personally to identify exactly what needs to grow (or be created), make it happen, and serve as the strategy and execution extension that allows you to thrive. Give us a frame of reference for your budget and your needs, and we'll be in touch! Use the button at the bottom of your screen to get in touch with us about a la carte options.